A few years ago, I published an article that compared self-storage security to a chain, a chain that was only as strong as its weakest link. A string of facility break-ins throughout the last year have demonstrated what I meant: Every component in the following stories works to some degree, except the lock, which results in a security breech. A headline in The Orlando Sentinel, July 16, 2010 reads: “Deputies seek help identifying self-storage thieves.” The article goes on to add that” Security cameras captured the thieves between 2:00 and 3:00 PM…” Unfortunately, the cameras captured the images of the thieves, not the thieves themselves, who cut through a chain link fence. A similar story from KIH TV in Houston this summer notes how “a few guys” were “caught” on camera on breaking into a facility one night, who then returned the next night, disabled the camera, and broke into more units. According to the manager, the storage facility is “beefing up” its security with more cameras. Are they going to be more cameras to break, or more cameras to record fuzzy images? The operator is also requiring renters to buy disc locks. In both these cases, and in dozens of others, thieves cut through a fence, broke into units, and were “caught” or “captured” on tape. They often bypass units that have disk locks. This January a story from Bradenton., FL added another component: The break-ins were discovered after deputies at 3:00AM responded to a door alarm. “The burglar or burglars entered three units in the interior portion of the business, and tried to break into a fourth unit,” according to a news release. Fences, gates, cameras, door alarms. They seem to serve a similar purpose in these stories: they record and announce crime. They may even deter it. But we also know that many thieves know how to defeat these costly visible devices. These cases seem to indicate that disc locks would strengthen the chain, but in many cases, operators merely recommend disc locks, or require only after the fact. What we often see is a facility with thousands of dollars invested in a fence, gates with keypad access, dozens of cameras, and even door alarms, with the thief’s final destination guarded by a five dollar lock. How can operators and renters get the full benefit of their security investment if they both go for cheap security at the end? A weak link at the thief’s destination negates any additional investment in other components. Cameras reassure your prospects and customers and deter thieves, but they only record crime. They cannot prevent it. Does a Five Dollar Lock Enhance or Undercut Thousands of Dollars in High Tech Security? After operators spend thousands on security devices, it is hard to believe that cost alone keeps some from using disk locks. Veteran self-storage consultant Jim Chiswell suggests that operational issues still make some operators reluctant to require or recommend disk locks. These owners and managers don’t like to cut or drill out disk locks—too much trouble. Regarding security, isn’t that the point? To provide “trouble” for a thief? A little investigation will demonstrate how to safely remove a disk lock. It takes time, and loud tools, but hundreds of operators do it easily. 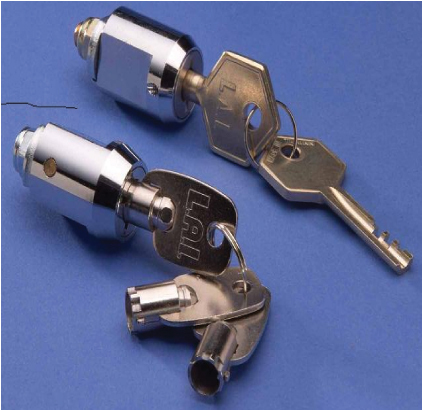 Some manufacturers offer disc locks with numbered keys that allow the operator to order a replacement key. Inconvenience is a poor excuse for maintaining low security, especially when promoting a secure facility is one way to stand out in a tight price-conscious market. 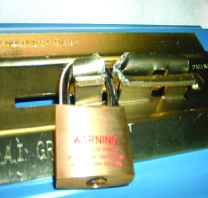 • Most disc locks have the same type of keyway as standard padlocks. With around a thousand key codes, there is a good chance of duplicate codes in a 400 unit facility. More seriously, that conventional keyway is pickable, and “bumpable” as well. You may have heard about the “bump key,” a method that can turn any amateur in a lock picking pro in a few minutes. Just search “bump key” into Google or YouTube and you won’t feel so safe relying on a disc lock. And the bump key works without leaving a mark. • There is an additional vulnerability to the disc lock, which hasn’t been exploited too much yet. With a hidden shackle on the latch, the latch itself is vulnerable. 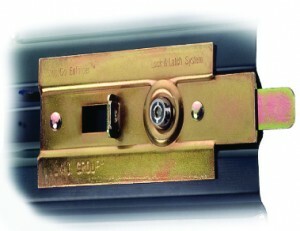 A bolt cutter can snip the slide bolt around the latch to break into a unit. Even with a tough padlock or disk lock, a self-storage slide bolt can be cut with a bolt cutter. The disc lock, while it is an upgrade to the padlock, still leaves the keyway and the latch vulnerable. The only way to add a security link that complements and matches fences, gates, cameras and alarms is a flush mount cylinder system. Why does a cylinder lock system provide greater security than a disc lock? Both a medium security cylinder system (built around a tubular vending machine style lock) and a high security system (built around a virtually drill and pick proof system with unique key shape) are flush mounted into the door with a back plate that provides additional strength. There is no slide bolt to cut, and both styles are much more pick-resistant than a standard padlock or disc lock. • A medium security tubular based cylinder lock will have 50 to 60,000 key combinations, a tubular-type key similar to those in many vending machines. Ask your lock supplier if the keys are numbered for easy replacement. They are considered medium security because can be picked by a tool readily available on the Internet. This system is a significant upgrade to any disc lock system, because tubular pickers still prefer vending machines. Both a medium and a high security flush mount cylinder lock system provide a security level that complements costlier components such as access controls, cameras and door alarms. In tough economic times, you and your customers are concerned about crime. But don’t be dazzled by technology. If a thief’s last challenge, at the door latch, is quick and easy, then you have wasted your money on your costly high tech features. Cylinder locks are a one-time expense. Most operators “lease” them free or charge a five or ten dollar administrative fee and keep the deposit if the renter doesn’t return the keys. In either case, at a relatively low cost, cylinder locks provide genuine security and a market advantage in a very competitive market. Take a look at the cylinder lock options offered by your lock manufacturer. Evaluate their security features and ask yourself if you want your renter’s door to be the most vulnerable place at your facility. You can also read the full article on page 54 of Self-Storage Now! Rich Morahan frequently writes articles and conducts seminars on security for a number of industries. He can be reached at 617-240-0372 or at rmwrite@comcast.net. Posted by admin on November 9, 2011 in Articles.